9.6 f. Weather forecasts and comparison to what really happened. Investiture Achievement Connection: This Honor is related to the Investiture Achievement requirements for WILDERNESS EXPLORER Nature Study which require (as one of two options) completing a project very similar to Requirement 9 of this Honor. Therefore this Honor is a popular choice for the Skill Level 2 or 3 Nature Honor required for WILDERNESS EXPLORER. 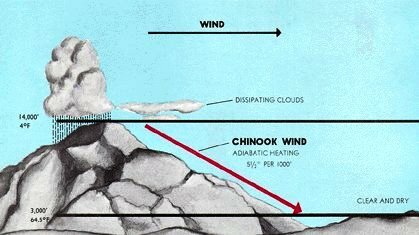 This Wiki has a page with instructions and tips for earning the Weather honor. Typical development of thunderstorms (a) into a bow echo (b, c) and into a comma echo (d). Dashed line indicates axis of greatest potential for downbursts. Arrows indicate wind flow relative to the storm. Area C is most prone to supporting tornado development. The winter of 1880–81, was referred to in the Dakotas for many years afterward as the "Hard Winter". Author Laura Ingalls Wilder devoted her book The Long Winter to the telling of that winter's story, a narrative of one successive blizzard after another, and the effects on her family and those around her. The book is only slightly fictionalized, as far as her descriptions of the weather. Her tale of two men from the town of DeSmet, South Dakota going after some wheat rumored to be stored some miles south of DeSmet in February of 1881 is true (Ingalls later married one of the men, Almanzo Wilder). It was speculated at the time that if the two men had not found and brought back the wheat, the residents would have starved before the eventual thaw in April of 1881 which allowed the railroads to resume service. The snowbound locomotive pictured above was photographed on March 29, 1881 in western Minnesota, not far from DeSmet. The thermosphere begins about 80 km above the earth. At these high altitudes, the residual atmospheric gases sort into strata according to molecular mass. Thermospheric temperatures increase with altitude due to absorption of highly energetic solar radiation by the small amount of residual oxygen still present. Temperatures are highly dependent on solar activity, and can rise to 2,000°C. Radiation causes the air particles in this layer to become electrically charged, enabling radio waves to bounce off and be received beyond the horizon. The mesosphere is the layer of the Earth's atmosphere that is directly above the stratosphere and directly below the ionosphere. The mesosphere is located from about 50 km to 80-90 km altitude above Earth's surface. Within this layer, temperature decreases with increasing altitude. The main dynamical features in this region are atmospheric tides, internal atmospheric gravity waves (usually just called "gravity waves") and planetary waves. Most of these waves and tides are excited in the troposphere and lower stratosphere and propagate upward to the mesosphere. In the mesosphere, gravity-wave amplitudes can become so large that the waves become unstable and dissipate. This dissipation deposits momentum into the mesosphere and largely drives its global circulation. This requirement is very similar to one found in the Explorer IA curriculum, except that Explorers are required to keep these records for two weeks and take readings twice a day. You can also combine these requirements with those in the Weather honor. If you forget to take records for a day, do not despair. As long as you have 21 readings, you can count this as three weeks. f. Weather forecasts and comparison to what really happened. This page was last modified on 30 July 2015, at 00:09.